Smartweigh Weight Server is used to interface weighbridge indicator to existing software applications like SAP, Oracle apps etc. 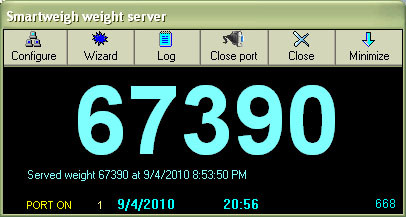 Weight server connects to the indicator through serial port, and serves the weight to the target application by saving the weight in a CSV or access file, copying to clipboard or through DDE. This enables to connect to weighing indicators without worrying about the protocol and the connection settings. Weight is saved intelligently, only when the weight is above the weight of the lighest truck, and only after the weight stabilises. You can also configure the weight server to save the weight automatically when the operator presses the print button. When weight is saved in an output file, only one row is saved. When the next weight is served, existing row is overwritten. In the target application, you can write code to take the single row from access/CSV file whenever the weight server alerts the operator by announcing the weight in human voice or beeping. Generally, weight server will stay in the system tray and work in the background. You can double click on the system tray icon to bring it up. e) For weight transfer to the target application, two more methods are supported - DDE transfer and clipboard copy. You can enable all three methods at the same time i.e. File save, DDE and clipboard copy. In case of clipboard copy method, weight server will copy the weight to clipboard. You can use Ctrl-V to paste the weight into target application. In case of DDE transfer, you can get the weight continuously from the weight server if you configure the target application as a DDE client. There is a sample excel sheet in the weight server folder, configured as DDE client. When you open the excel sheet, you can see the weight in the cell changing exactly as the indicator. When weight is transferred, date/time is also transferred for reference. Built in Indicator connection wizard automatic identification of most of the indicators like Avery, Ricelake etc. It also generates a report to give you complete information about the protocol used by connected indicator and proceeds to give you suggestions.